How the Year of the Rabbit affects you! Click to jump straight to how the Year of the Rabbit affects you in 2011! Welcome to the Chinese year of the Rabbit. Each February marks the beginning the traditional Chinese calendar year. Because of the size of their population this calendar is probably the most followed in the world! New Year begins a new zodiac animal cycle, the Year of the Metal Rabbit. Chinese tradition employs both Solar and Lunar calendars. Using the Solar calendar, it's the 5th of February, but the New Moon day of the 3rd of February is the official Lunar New Year celebration day. 2010 was the Year of the Metal Tiger, and what dramatic year! Now in the cycle of the twelve comes the calmer and more community minded of the animals, the social Rabbit. He is a discreet animal, prudent and very honest. In work and productive fields he is serious and persevering. The motto of the Rabbit is "it's no good hurrying, you must start with punctuality". The Rabbit is a great friend to all who are with him. He seems to exude a mysterious presence and this causes the Rabbit to sometimes be quite an elusive presence. He's know to be solitary and enigmatic and at times quite subtle. People born in the Year of the Rabbit are kind, loving, and dislike hostile actions. They give others an impression of being frail because of their gentle appearance, but in fact they are strong-minded and have very strong wills. Rabbits pursue their ideals all their lives in a precise and orderly way. They do things slowly and deliberately because of their caution. There is little need to worry about them: Rabbits are nimble, clever and good at avoiding harm to themselves. They are talented and like artistic ventures, such as painting and music and are generally active in these areas. They are also very hospitable, good hosts and warm-hearted companions. They dislike embracing others in public places, however. They know about the art of saving face and giving consideration to both sides of a question. There's a bit of Libran balance and beauty in them. The Rabbit, the Chinese say, will live up to one thousand years and turns completely white at the age of five hundred years. The Taoists maintain the rabbit is the mixer of the elixir of life and is the servant of a magician. He is considered to be the most difficult sign to describe, because there is an element of complexity and infinity about him. He is very sensitive to the underlying currents and sensations in the air and in people. His intuition is very important to him. It's useless to discuss logic with a Rabbit as he listens to the 'vibrations' and not the words, facts or figures. In mediæval times the Rabbit was seen as bad luck on journeys, yet the Rabbit also has a history of being a good luck omen. In Pagan times he was worshipped as the sacred animal of fertility and involved in the rites of Spring. The rabbit's paw is traditionally associated with good luck and it seems to have come from an 18th century belief that rabbits'paws kept rheumatism at bay. In China the rabbit is a sign of longevity and has always been associated with the Moon and thus is feminine and Yin. The oldest Chinese traditions maintain the rabbit came from the Moon and if you look at at the Moon, many people actually see a rabbit in its features at Full Moon time. Rabbit people are usually relatively careful when it comes to their finances. They use much of their money for possessions, such as their homes, cars or furniture. They love hunting for antiques, arts and crafts and will tend to make sound investments in these types of things. In work the Rabbit likes or gravitates towards careers in literature, art, music, design, public relations, counselling, advisory occupations and law; they also make very good secretaries. Nice possessions make them feel really comfortable. Their homes and offices usually are clutter-free. They have really good communication skills and are best in positions of management. They are very diplomatic and well-organised and can also make great painters or musicians, due to their sense of beauty and their love of creativity. The ideal partner for a Rabbit is one who is loving and kind-hearted, and always fulfills their partner's desires. They are affectionate, attentive and tender people who never forget a birthday and are very sensitive to the needs of their partners. Rabbits blossom in love and diffuse an aura of happiness through the family. But they need active or constant warmth, or they can fade away. There's a need to feel secure and loved. Rabbits are faithful by nature, but have trouble if it gets too passionate and if conflict abounds. If there is too much conflict they will leave, but if that is not possible, then they become ill as a reaction. Rabbits detest partings and hope that they will not have to depart, but look for something to restore the relationship they try to cherish. Mr and Mrs Rabbit value marriage and intimacy, but sometimes feel ill at ease as parents. They do indulge their children, but get very put out by the upheavals that children will sometimes impose on parents. Rabbits will not let their child smash the best vase, or write on their beautiful walls. When it goes wrong they will oscillate between anger and laughter. Rabbits get on very well with Oxen, other Rabbits, Snakes, Sheep, Dogs and Pigs. They dislike the extreme lifestyle of the Rat; with Tigers they have trouble with the Tiger's daredevilry; with Dragons they have to be second and endure, otherwise they are forced into a confrontation which they dislike. With Horses they have to be loving and comforting, otherwise it falls apart. With Monkeys they find that the Monkey's principles may clash with the high standards that Rabbits always maintain. With Roosters they can clash, as the two signs are opposite each other in the zodiac. The Rabbit loses his legendary tolerance pretty soon with a Rooster! Of course, these are quick comparisons and a proper reading is only possible with a full Chinese zodiac chart. Politicians and Campaigners: Gordon Brown, Leon Trotsky, Fidel Castro, Garibaldi, Eva Peron, Stalin, Queen Victoria. What is the Rabbit Year all about? 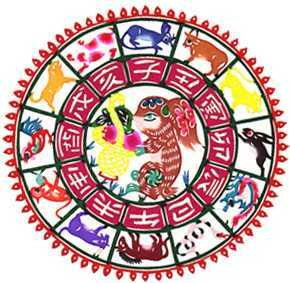 The Chinese Year is always made up of two parts, the Chinese animal sign and the year element. The Year of the Rabbit is made up of two elements, with Yin Metal element sitting on top of Yin Wood. The Chinese calendar year works on a 60 year cycle. This means we last experienced the year of Yin Metal over the Rabbit in 1951. This was the year when the Korean War was at its fiercest, when the Chinese and North Koreans captured Seoul in January, then the UN troops recaptured the capital in March. Nuclear competition went ahead, with many countries testing their atomic weapons. And in July, King Abdullah of Jordan was assassinated by a Palestinian in Jerusalem. In the USA the Rosenbergs were sentenced to death for espionage. Metal over Wood is often associated with war in history. The clash between Metal and Wood shows here. On the other hand, the peaceful needs of the Rabbit led in April 1951 to the Treaty of Paris being signed, establishing the European Coal and Steel Community. This was the first of several deals that eventually became the European Union. July saw the beginning of armistice negotiations that led to the end of hostilities on the Korean peninsula. And, in September, Australia, New Zealand and the United States signed a mutual defence pact called ANZUS. The peace treaty with Japan and the US was also signed that year. There could be some aggressiveness when it comes to fighting for causes, but it's not likely to be a dominant. Yin Metal is more thoughtful, in contrast to Yang Metal which pushes ahead impulsively. Under the Rabbit's influence, there is more empathy, with only occasional lapses. So this can be a very different year from last year. "Let there be peace, and let it begin with me", is the Rabbit motto. The Tiger year made tidal waves, but the Rabbit mends things. Diplomacy is more likely. If you want to improve your chances of success, you need to negotiate and co-operate rather than trying to force your ideas and methods on others in 2011. It's a time to kiss and make up. Forgive all and let's all get along. If in 2010 the emphasis was on drama and excitement, it's now on harmony. The Chinese character for Yin Metal represents decorative objects, such as jewellery and bracelets, but it can also symbolise a small metal weapon, or a dagger. Thus the possibility of assassination by knives for leaders is here in 2011. Metal in general is associated with the quality of leadership, loyalty to friends, brotherhood, and justice. Yin Metal possesses a quality of loyalty and justice, although it appears more gentle on the outside. As the Wood element symbolises trees and the environment, expect that Metal attacking Wood will cause accidents leading to more destruction of the environment. Natural disasters such as forest fires may cause more damage. The Rabbit year is going to be the time to attack the most difficult issues you face. You have one of your best chances of achieving breakthroughs. If you do run into stiff opposition, don't give up but be persistently negotiable and you will be assisted to get through the difficulties. It's very appropriate to look at Lewis Carroll's character this year, as white is one of the colours of Metal and it's a Rabbit year. The White Rabbit is a fictional character in his book, Alice's Adventures in Wonderland. He appears at the beginning of the book wearing a waistcoat, and muttering "Oh dear! Oh dear! I shall be too late!" Alice follows him down the rabbit hole into Wonderland. Alice encounters him again when he mistakes her for his housemaid Mary Ann and she becomes trapped in his house after growing too large. The Rabbit shows up again in the last few chapters, as a herald-like servant of the King and Queen of Hearts. When I searched through internet media with the term "white rabbit", I found 47 references to plays, films and TV with this character in them. The White Rabbit is a certainly a strange and topsy character who will have quite some impact on the way we experience this year. Many of us are to experience White Rabbit moments in our growth in 2011. In fact some of the growth on the planet this year will mean we will collectively experience these metaphysical moments in 2011. 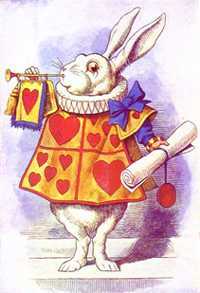 I would not underestimate the growthful and insightful experiences that the year will bring as the White Rabbit of Wonderland fame is our totem animal for 2011. We will most likely have to choose between taking the red pill or the blue pill, as in the movie The Matrix. In Lost, the White Rabbit is alluded to several times in the series. First it is the name of the episode, and John Locke claims that Jack is chasing the White Rabbit in the form of his father. The White Rabbit is also the symbol for the Looking Glass Station and it is also carrying a clock with it. In Star Trek, near the beginning of the 1966 episode "Shore Leave", the White Rabbit appears to Doctor McCoy. In The Matrix Neo is told to follow the White Rabbit on his computer screen in a "waking up" metaphor. Seconds later his doorbell rings and, when he opens the door, he finds a woman with a tattoo of a white rabbit on her shoulder. She takes him to the club, and who is waiting for him there, at the club? A beautiful woman named Trinity (the trinity of the godhead? ), the path to his transformation. He meets Morpheus who says in that early scene, "This is your last chance. After this, there is no turning back. You take the blue pill—the story ends, you wake up in your bed and believe whatever you want to believe. You take the red pill—you stay in Wonderland and I show you how deep the rabbit-hole goes." Alice in Wonderland . In Tim Burton's 2010 film, the White Rabbit works for the Red Queen, but is also a secret member of the Underland Underground Resistance, and was sent by the Mad Hatter to search for Alice. Johnny Depp (who is a Rabbit year person) is the Mad Hatter character in the film. Jefferson Airplane wrote an inspired psychedelia song in 1967, "White Rabbit ". The first lines: "One pill makes you larger, And one pill makes you small, And the ones that mother gives you, Don't do anything at all. Go ask Alice, When she's ten feet tall". If you want to be in the White Rabbit mood watch them on You Tube! The basic five Chinese elements represent different parts of the body. Metal relates to the skin, nose, body hair, mucus and the lungs. Health problems in a Metal year can be breathing problems through influenza. Yin Metal is associated with the lungs and breathing and therefore those with weakness in the lungs can have it lead to more illnesses. Problems related to poor air quality, allergies and flu will be serious in 2011. The Rabbit is Yin Wood which is the neck and the back . Metal attacking Wood causes problems with back pain and motion sickness plus things such as Parkinson's disease and bone issues. Good examples of Metal attacking Wood causing these illnesses are Stephen Hawking, Mohammad Ali, and Michael J. Fox. Their condition is caused by too strong Metal attacking the Wood element, and damaging its movement. Wood rules the liver, and the Rabbit/ Rat zodiac orientation this year generates liver problems. There is an absence of Fire element this year, which brings stomach issues, weak heart and poor circulation. It's very important to look at your intake of antioxidants. Metal sitting on Wood weakens Metal, so 2011 is also not favourable for people who have weak immune systems. Take immune system boosters. The Metal element of 2011 brings prosperity to Fire industries and productivity to Earth industries. The Fire industries include finance, entertainment and energy. In economics, the Fire element is usually the driving force behind the stock market. The Five Elements strongly affect people's moods. In general, Fire is joy, Water is fear, Earth is meditation/support, Metal is sadness and Wood is anger. In 2011, the Rabbit is pure Wood, it is not as strong at generating Fire as the Tiger year. The economy will not be fast-moving this year, but there is stronger Fire in the northern summer in 2011, so the stock market will continue to be active in the middle of the year. However, with strong Water coming in 2012, the Water Dragon year, we have to watch for setbacks in the northern autumn/ winter of 2011. The Metal year brings action to Earth industries, which include property, hotels, mining, and insurance. The second best industries are Water ones. Water industries are shipping, beverages, transport, and communications. Metal needs Fire to melt it into useful tools, and with the absence of Fire in 2011 it's not great for Metal industries like banking, machinery, hi-technology, and cars. The industry which is not favoured again is Wood, which includes forestry, furniture, fashion, textiles, paper, media, newspapers, magazines and environmental protection, so it's an uphill year for them. Click here to read how the Year of the Rabbit affects you! Richard Giles is a Feng Shui practitioner and astrologer who is available in Australia for consultations on your home and business. He has been involved in astrology for more than two decades and writes for several Australian magazines. He is also the director of the Earth Healing School of Queensland, running practitioner courses in Earth Healing and Geomancy. Click to contact Richard Giles.